A few weeks ago a 6.4 Richter scale earthquake stroke the Caribbean, near Puerto Rico. My house, a concrete shelter, is located about 59 kilometers away from the epicenter. It was 12:01 AM when the ground started to shake. Clearly horizontal, I felt the motion and saw the furniture swaying while watching TV. Intrigued, I then rapidly stood up from the sofa, trying to balance my body. Thankfully, the motion stops after about 10 seconds. It cannot be considered a major earthquake, I rethink those 10 seconds however, I remember myself standing with my feet separated, my arms were slightly apart and my posture was crouched. That was my skeleton reacting to the environmental stimuli as following a fixed action pattern. I didn’t fall. Then I wonder how does the concrete house react? Unlike myself the house takes no action, it does not try to protect me nor protect itself. The material of the inner architecture did not morph in order to rearrange the force, pursuing balance. Like a standing corpse it stood still, indifferent and unnatural. Even though concrete is highly threatened by seismic motion, this time the house did not fall and the concrete did not crack, its integrity was outstanding for the seismic magnitude. Why the difference between my body and the house? Buildings are based on man-made materials and have been developed to withstand environmental stimuli because they are inanimate matter. By contrast living matter interacts with the environment and therefore has evolved to embrace the stimuli and flow with various external input. Then I considered how does the human skeleton adapt to avoid falling or breaking during major motion? The structure of our body has evolved to walk, run, jump, and even dance. Natural reflexes help us to maintain the body equilibrium during the different channeling of forces throughout our skeleton. Our structural system has evolved to keep its integrity even when subjected to variable acting forces on the body. Dancing loads on the body for example are as analogous to seismic loads on structures. Then I considered, if earthquakes are intrinsic natural events then how could a concrete structure evolve in order to be a good dancer? From inception to present day concrete has been improved to reach both structural and architectural leadership above all other construction materials. The inception of concrete began 12,000,000 years BC when reactions between limestone and oil shale occurred during spontaneous combustion in Israel, forming the first natural deposits of cement. The first record for its use in building design is 3,000 BC when the Egyptians used mud and straw to bind bricks, and lime as the binding agent for constructing the Pyramids. In 300 BC the Romans had further developed the cement matrix using slaked lime and volcanic ash to create concrete-based architecture, a prime example of this application is for the construction of the Pantheon in 200 BC. Fast forward to 1756 and the evolution of concrete is accelerated rapidly, starting with the design and development of hydraulic cement by John Smeaton, followed by the patent of a natural hydraulic cement by James Parker in 1796. Further improvements to the mortar occurred by Louis Vicat in 1813 and James Frost in 1822. In 1824 English Bricklayer, Joseph Aspdin patented Portland Cement by designing what we now refer to as the ‘clinker’; the primary ingredient of modern concrete. Concrete further evolves in 1867 when Joseph Monier invented reinforced concrete; its initial structural paradigm remains today. Since inception the technology of concrete was improved, aiming to upgrade structural performance and reach marketability and thereby achieving adaptability. In 1824 when the material reached. In the last 140 years however, very few improvements have occurred to the properties of concrete. Concrete remains the same while our planet changes, including new weather patterns and more frequent tectonic activities in dense urban areas. Should concrete therefore evolve once again to be more suitable for our changing planet? Globally, concrete is the most widely used construction material. Concrete is in fact, it is the only resource we consume more than water. The composition of concrete is based primarily on grains, giving concrete the dominant properties of granular materials. Because of this, even the best concrete has a tensile strength barely one tenth of its compressive strength. Therefore, even the strongest concrete building is highly susceptible to failure by a strong earthquake or impact. Today, cities are looking toward resiliency and ecology in order to approach new design and living standards that are more sustainable. The resilience of a city depends on its ability to absorb its contextual stimuli, such as environmental, and geological factors. Concrete however is unable to absorb important geological stimuli and as such will concrete become redundant? In 2010, Chile was severely damaged by an 8.8 Richter scale earthquake, resulting in the damage and collapse of many reinforced concrete infrastructures. As this time many structural engineers questioned the appropriateness of concrete as the material for making our cities. Concrete’s current paradigm is based on artificial progress, relying on stiffness and volume to withstand stimuli. In order to reach true resiliency, I believe concrete can evolve and improve by developing ‘dancing skills’ and inherently naturalizing its character. 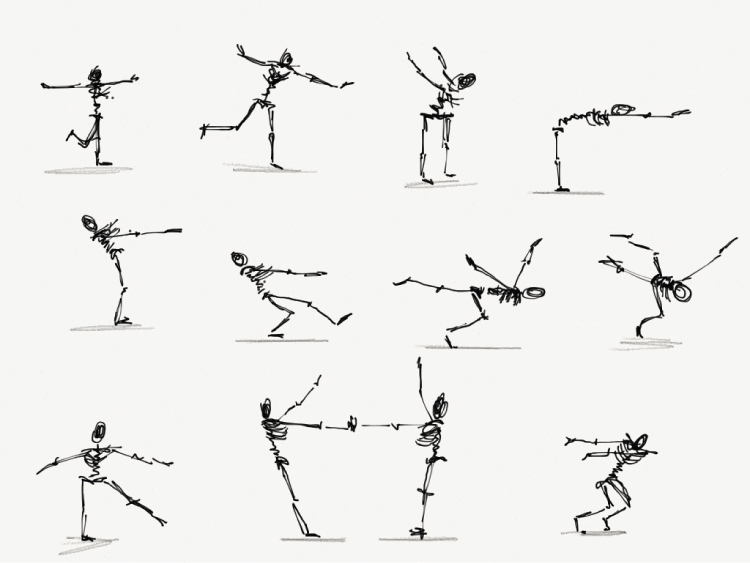 There is no structure that has evolved better to dance than the human skeleton. What can bones and the skeleton teach us about seismic resilience? The mechanic of our bones in fact parallel to those of reinforced concrete. Both have a granular mineral with impressive compressive strength and an elastic material to take tensile strength. But the remarkable difference between our bones and concrete is resilience. 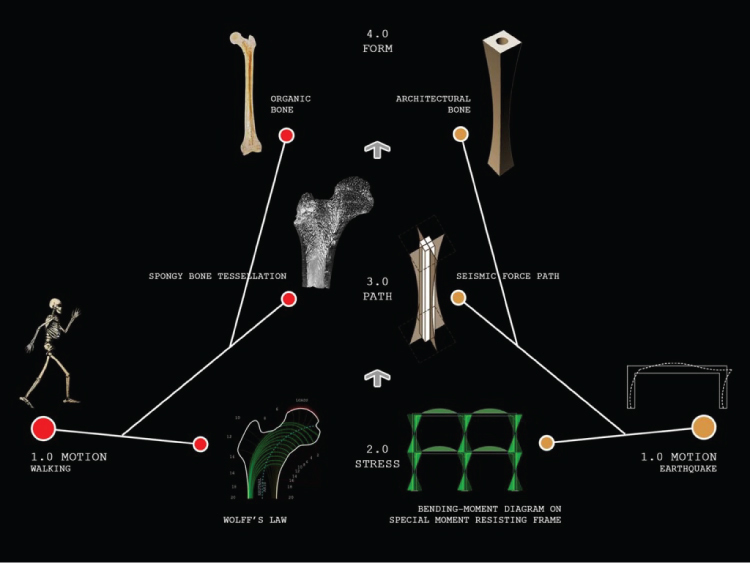 Our bones trump concrete on parameters of structural adaptability. Our bones contain inner loads channels allowing for material growth and optimization of ‘internal architecture’. Such optimization makes the bone a lightweight and performative morphology. Because it is a lightweight structure, the intensity of forces within remains low and loads have an effective and efficient path to channel. At a larger scale, the skeleton is well adapted to dissipate energy. Joints that connect our bones dispel forces through channels and thereby decrease the loads generated by unaccustomed inputs upon the body, just like those generated when dancing. Furthermore, our primitive consciousness stores different body postures for structural balance and avoid major injuries. Presently, an investigation into the development and evolution of concrete to allow for ‘dancing’ properties is taking place at the School of Architecture of the Pontifical Catholic University in Puerto Rico. The rhythmic forces of the typical earthquake have been used as the main load parameters for structural adaptability. Algorithms based on the growth-driven morphology of bones have been traced for the design of non-prismatic concrete frames better adapted to channel rhythmic loads. We have measured improvements to the material performance of concrete by mimicking the bone shaft and variable thickness according to load values. Form follows function is no longer relevant, in this application form follows force, or more specifically form follows the rhythm. Moreover, tensile-based fabrication methods inspired by the growth of bones are being studied in order to naturalize the matter arrangement of concrete. Computational models complement such explorations for the definition of a naturalized structural response. A whole new character of seismic-responsive concrete is being developed in coordination with cement manufacturers, geotechnical and structural departments. At the Biotectonica Research and Design Studio, we are researching how to program structures to sense seismic stimuli and morph in order reach equilibrium. In a highly active seismic zone such as Puerto Rico, where concrete structures totalize more than ninety percent of construction, we are investigating how to improve concrete’s paradigm. In this process however we realize that we have indeed started to design a whole new character in order to foster concrete’s evolution in adaptability. By defining bones as concrete’s biological counterpart, we are also able to naturalize this artificial stone DNA. The investigations continue, but hopefully in the future, when another earthquake occurs my concrete shelter will be as sensible as me, naturally responsive and as resilient as any other living structure. With a suitable skeleton, and the necessary instincts, concrete structures will be finally able to dance. Salvadori, Mario. (2002) Why Buildings Stand Up: The Strength of Architecture. W.W. Norton & Company, Inc.
 Ambrose, James & Dimitry Vergun. (1999) Design for Earthquakes. John Wiley & Sons, Inc. Interesting article. Gaudi immediately comes to mind, even if his forms were the result of different rationale. Further it reengages a centuries-old dialog about the image of man and the body in architecture but extends it beyond mapping/planimetric and proportional systems. I’d like to see the analogy extended to include the muscular systems and their role in supporting/stabilizing the skeleton. We all know that with poor muscle strength, bone will tend to grow improperly, developing bone spurs and the like…leading to arthritis, pinched disks, etc. Chiropractors will argue for adjustments to the spine to sort out issues of trauma. Physical Therapists argue for the manipulation of muscle. I think what would be valuable is to integrate/develop a sheathing that works in partnership with the building frame. Of course you could go mad: then what is the cartilage, etc.? Neoprene spacers? Shear blocks? Since the inception of the research in 2008, several concepts has been studied and considered in order to design a novel but realistic structural system. 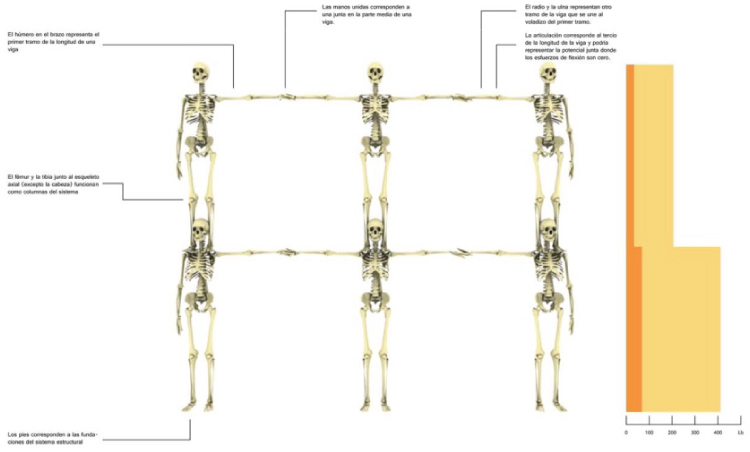 Structural system of the human body is a combination of the muscles and the skeleton, in fact it could be compared to a tensegrity structure. Thus, the original approach included some steel cables as muscles wrapping the concrete frame and, thereby maintaining the posture and integrity of the building frame during lateral loads. Also, damping joints were considered but changing their position in the frame according to the concentration and channeling of forces. Then we argued, why couldn’t we design a structural frame with all those structural and mechanical benefits embedded in the material itself? 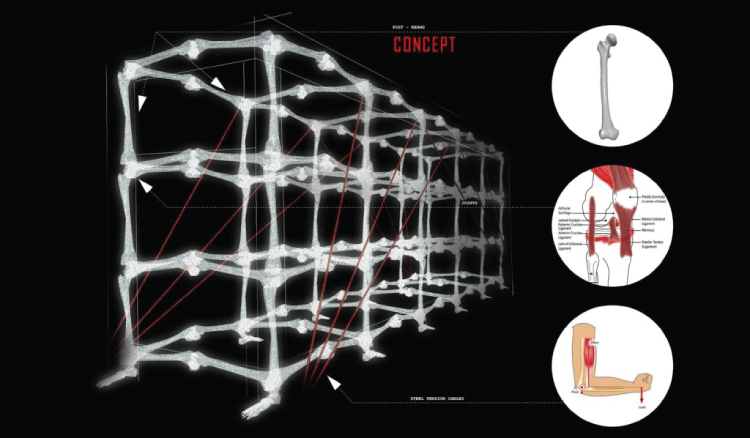 Bones have already tensile principles and damping features that can be extrapolated into an improved building skeleton. Instead of separating all those features in different systems and technologies, current research is based on a single material that changes its mechanical properties and functions along the frame. Ahhh…I see you points. Cool. In some respects, it would be nice to ennoble the lowly building skin yet again and it could offer some redundancy that antiquated construction methods (I’m really thinking of stick-frame construction from the late 19th and early 20th C. in the U.S.) previously did…. But I totally see how you are able to address the issues holistically within the same system. Thanks!